None of the Above (NOTA), also known as – against all – or a – scratch – vote, is a ballot option in some jurisdictions or organizations, designed to allow the voter to indicate disapproval of all of the candidates in a voting system. It is based on the principle that consent requires the ability to withhold consent in an election, just as they can by voting no on ballot questions. The Election Commission of India introduced the option of negative vote (NOTA) after a recent Supreme Court order. The Election Commission had already well before the elections in four states that higher number of None of the Above (NOTA) votes will have no effect on the winning chances of a candidate in the upcoming elections when the person has bagged the majority of votes. Candidate who seeks majority of votes will be declared elected even if number of electors taking option under None Of The Above (NOTA) is higher. In the case of elections to Lok Sabha and Legislative Assemblies, where there is only one contesting candidate in the fray, the Returning Officer has to, in accordance with the provisions of the said Section 53(2), declare the sole contesting candidate as elected. EC clarified that the NOTA option, which is an expression of a decision not to vote for the contesting candidates, is not relevant in such cases. In fact, the NOTA option provides the voters with a unique right to disapprove all candidates on the ballot. As per news reports, this option has been introduced keeping in mind that it could put pressure on parties to field better-qualified politicians. 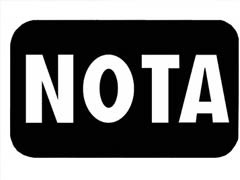 The use of NOTA button during the Assembly elections was – Delhi less than 1,000, Chattisgarh 2,000 to 6,000, MP 2,000 to 10,000, Rajasthan 600 to 5,000 and Mizoram 49 to 200. A glance through the trends of the election trends for constituencies show that very few have actually pressed the NOTA button on the electronic voting machines. In Delhi, despite 65 per cent voting in the recent Assembly elections, the use of NOTA was only by 49,000, say 0.6 per cent only. While in other backward and poor states of Rajasthan, MP and Chattisgarh, the NOTA button was used to the extent of 10 per cent. Even in MP, there were certain seats where the NOTA votes cast was from 2,000 to 10,000 but these were not accounted as in the eyes of law, these are invalid votes which has no value. In such circumstances, now the question is as to what purpose is serving the use of NOTA button during the elections. According to the experts, the impact of NOTA could be seen only after the two-three rounds of Lok Sabha and Assembly elections. With the increase of number of NOTA votes, it will create a pressure on the political parties to field the honest and dedicated workers in the elections. However, another election analyst is of the view that NOTA has no meaning at all and it is just a negative vote. NOTA does not indicate the disliking of voters for the particular candidates. In such a situation, its existence and non-existence does not matter as this will reduce the difference of winning and losing votes. But the introduction of NOTA is being seen as a first major step towards sweeping electoral reforms in the country. If the election figures are an indicator, NOTA are still very away from making an impact.